Whether you are male or female, just starting out or settled in, you will amaze yourself in our easy classes. Check out our two most popular class offerings, some of our project classes or even go beyond stenciling. And one of our newest classes is unrelated to stenciling, but guaranteed to be fun. Explore your senses in – Creating a Peaceful Environment. If our workshop schedule conflicts with yours, consider having us come to you! 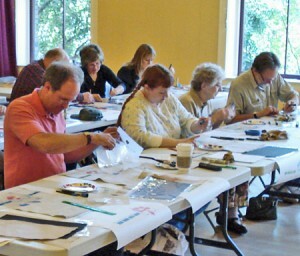 We are now offering private stencil classes, but this ain’t your average hawking housewares party. No pushy sales, just lots of fun. Click here for more information. Perhaps you know of an organization that might be interested in our classes. Or maybe you have a specific workshop request. Whatever the case may be, just shoot us an email! Here’s a link to our contact information. We also offer classes around the country. Keep abreast of new class offerings by joining our email list.